← Do You Think He Will Float? 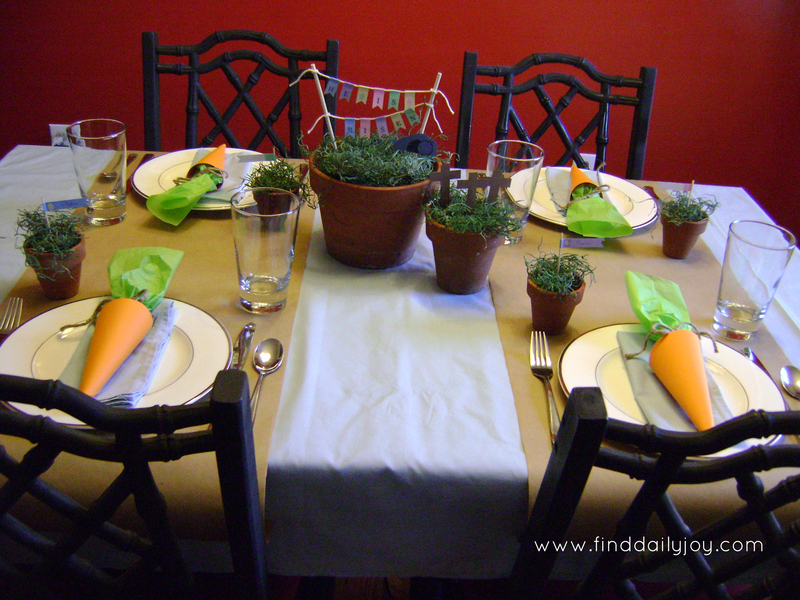 Stephen thought I was a little crazy but I wanted to share my Easter tablescape with you. It didn’t turn out exactly the way I wanted but I suppose few things ever do. In my mind I envisioned having lots of terra-cotta pots filed with lush, green, real grass. HA!! I should have known better than that. You do remember me talking about my track record with plants, right? 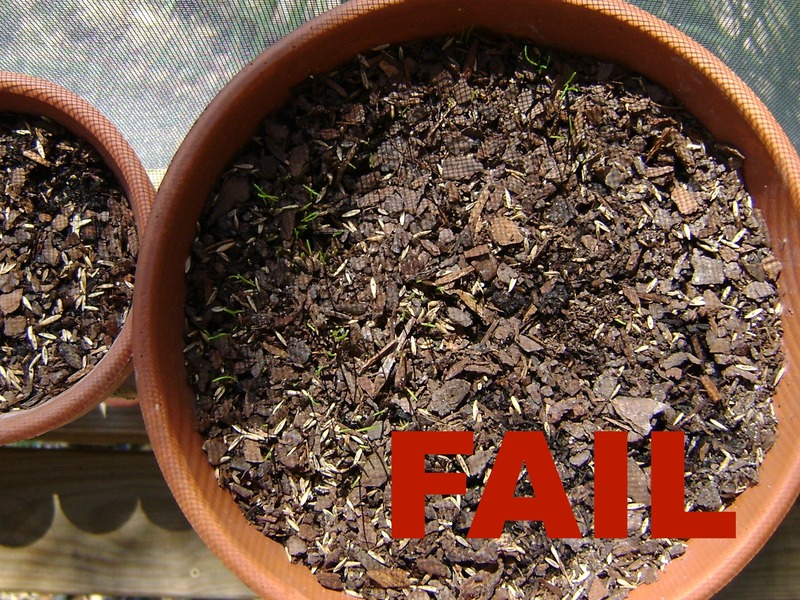 This is how my grass turned out……good thing it wasn’t my science fair project! Since my grass didn’t grow I decided to go with spanish moss. I hesitated on the spanish moss for a little while because it looks grey and dead and I wanted green and lively. So, to perk up the spanish moss I spray painted it green and then placed it in the pots. Then I assembled my mini Easter bunting. 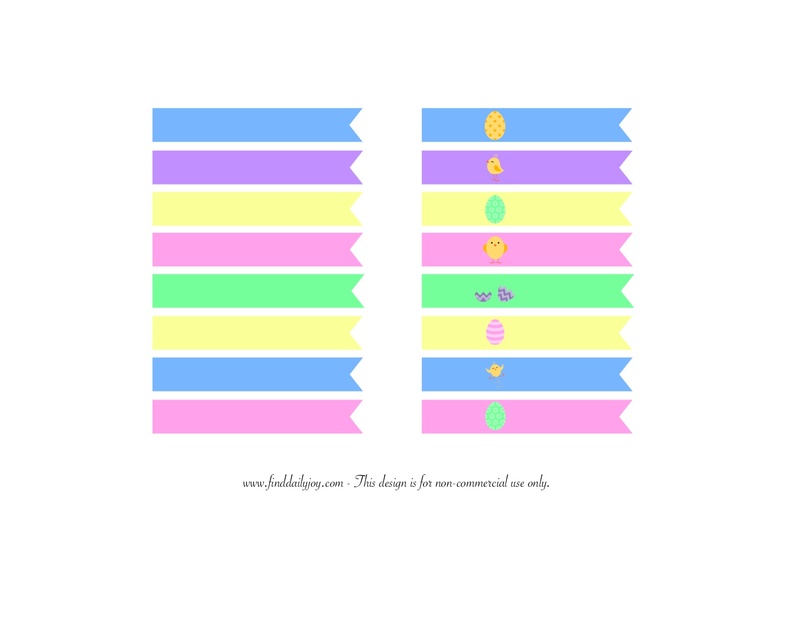 Print off bunting (download file below) and cut out the pieces. Wrap each piece around a small cord and glue. I left about .25″ between each piece. Tie the ends of the strings to chopsticks. 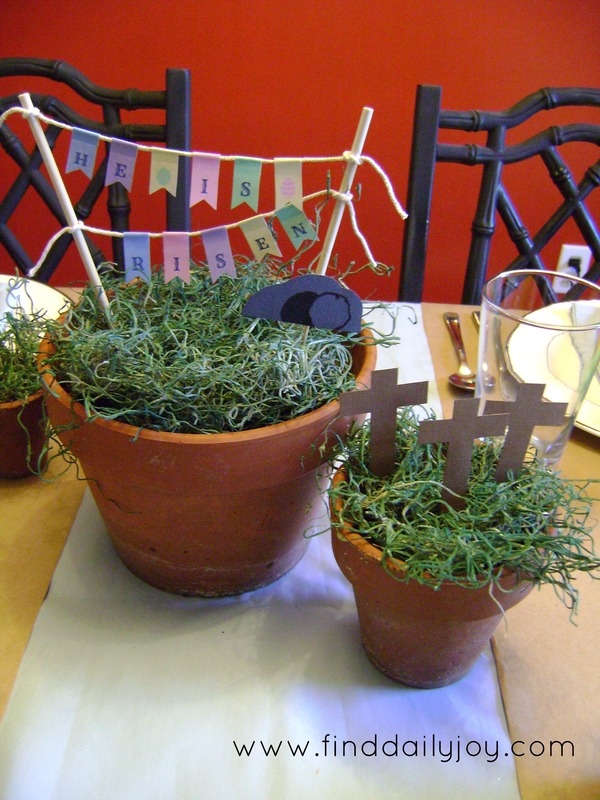 To finish off the centerpiece I cut out a little tomb from gray cardstock and three crosses from brown cardstock. 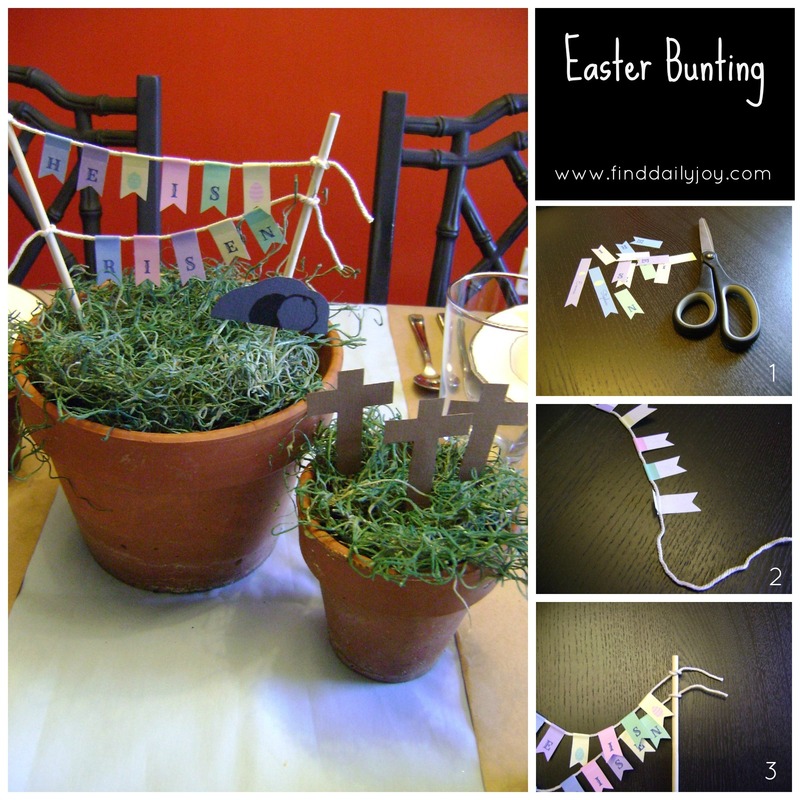 I attached each of these to toothpicks with tape and stuck them in the pots along with my Easter bunting. 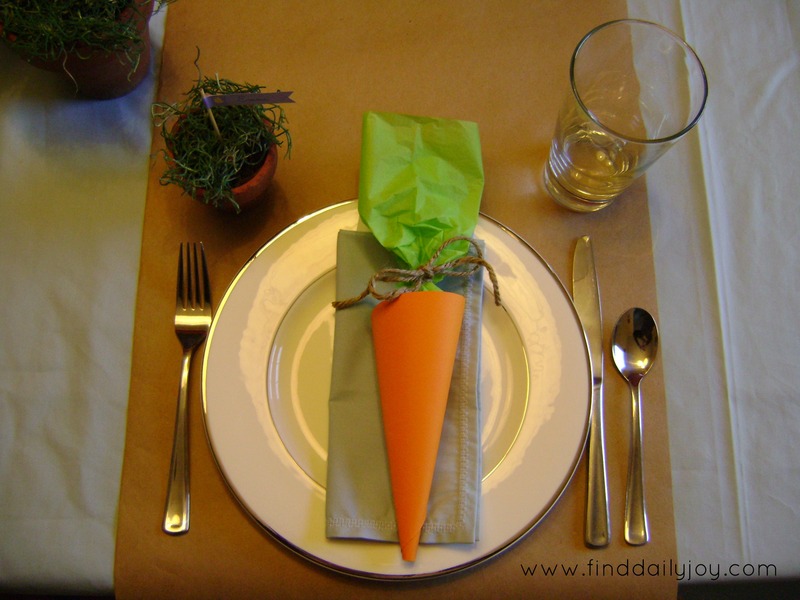 If you want, you could always do a this slight variation on the centerpiece. 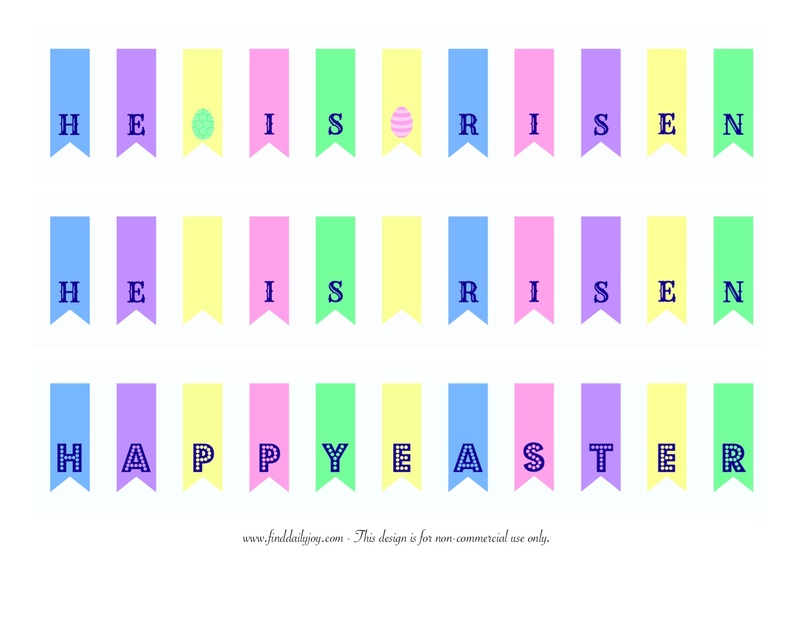 I included both the “He is risen” and the “Happy Easter” bunting for you. Hey, you like variety right? Next up is the place cards. 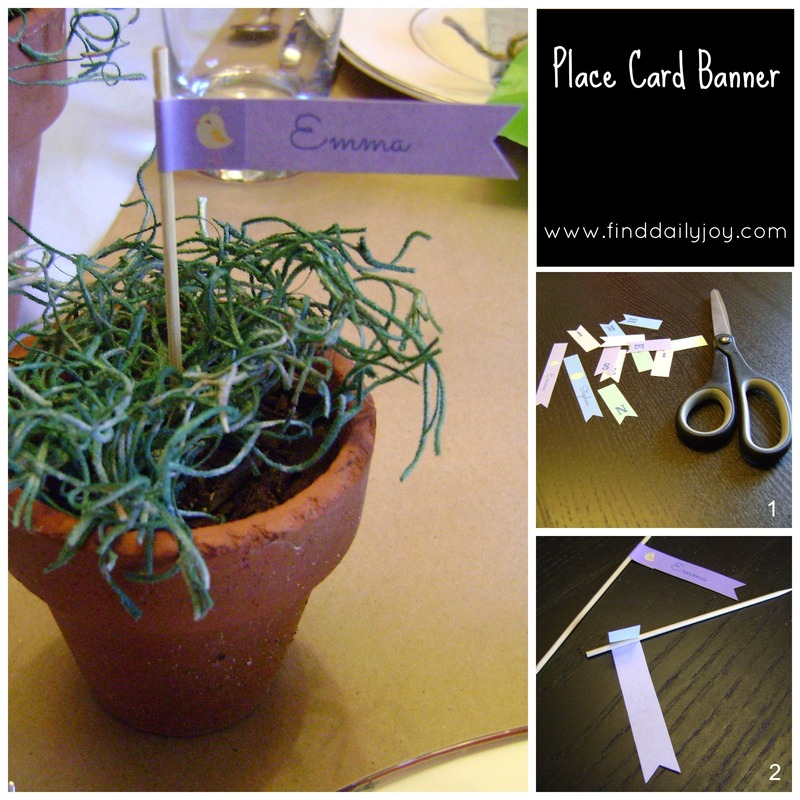 Print off the banners (download file below), cut out the pieces and add your guests names. Wrap each piece around a snack pick (these are a little longer than tooth picks and have a nice, non-pointy top) and glue. Well, that just about does it. To download your free printables right click on the images and save them to your computer. I’ll be linking up to some of these great parties listed here. Beautifully done and so, so cute! Wish I was coming to your Easter Meal! Thanks!! I just hope there aren’t any major “fails” with the food. 😛 We miss you guys! 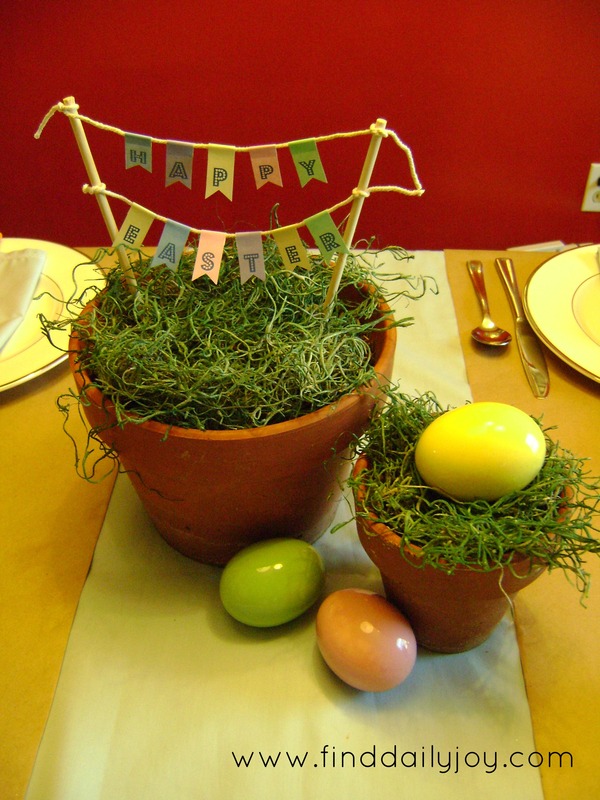 What a great idea for an Easter centerpiece. I would love for you to share this at my Friday T.G.I.F. linky party 🙂 Have a great day! !